The summer over here began impressively, with rain a few days ago and a jolly good thunderstorm today. It was a morning one, and very impressive. Well, it sounded impressive. I was actually in bed, having a sleep-in, which was very pleasant, while listening to the rain coming down outside. It did so for quite a while. At midday the sky was still very dark, as the following photo shows. As a photo it’s not very interesting, but it shows a dark sky. I couldn’t successfully capture any lightning. The thunder rumbled all day. It felt nice to be having similar weather to Adelaide, even though we have it hot at present, and you people certainly do not. Given the incessant nature of the rain, I decided to bite the bullet and buy myself an umbrella, and be congruous in this respect to the rest of China. I’d been avoiding getting one, as a pashmina over the head and shoulders is usually quite sufficient for most of the light rain we have had up until now, but this was rain that came down with the sole purpose of coming down fast and hard and creating puddles and getting people wet. (By the way, someone should ask Andrew about his nice Clipsal umbrella. Ask him what colour it is . I feel a bit like the guy at the end of George Orwell’s Keep the Aspedistra Flying; ‘I submitted to society’s demands in the end, but felt smug that I lasted longer than most’. OK, so what colour isthe umbrella? Not pink is it ? Oh, and here, its been c..c…c..c..cold. 3 or 4 in the mornings, except for sunny Mt Barker where its been roughly freezing. This weekend: 15 and rain. My “Clipsal - Electric Imagination” umbrella is a rather bright purple! 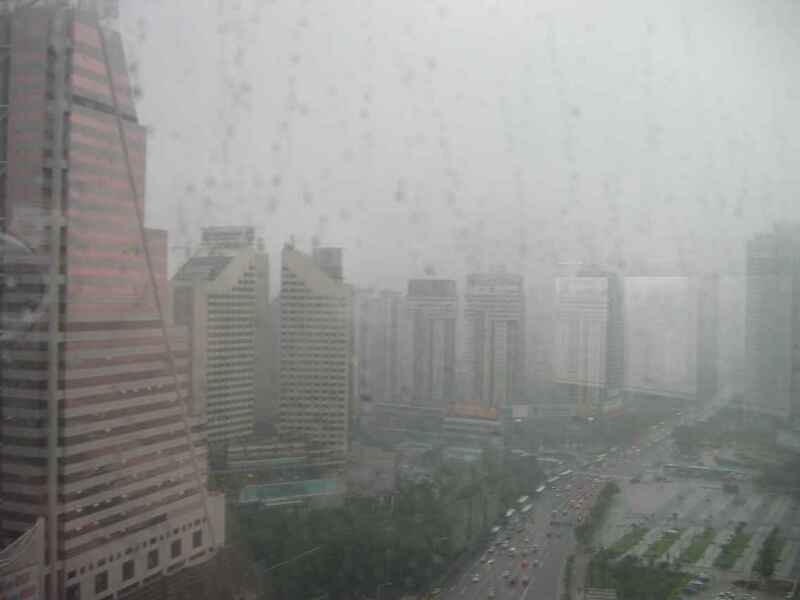 This weekend in Shenzhen will be 25 -26 with thunderstorms, humidity and rain.